We got up, got showered, got dressed, then went over to the restaurant to have some breakfast. After that we packed up the car, got our cameras ready (Joi gave Reese a PowerShot A1300 for his birthday), and queued up for our tour. We decided on the Historic Tour, a two hour long, two mile hike through some of the more historic parts of the cave. 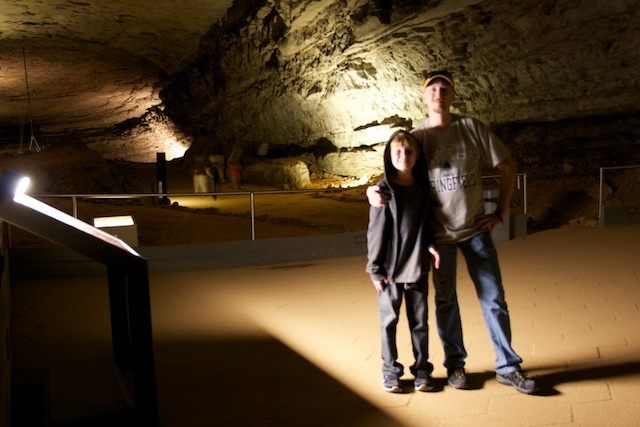 This was Reese’s first trip underground, and he really loved it. We got some good shots throughout the route we hiked. I think he wants to come back to do the Trog tour, a ranger led, no parents tour that gets them down and dirty in the cave. I’m really hoping that taking him to these parks will instill a love of the outdoors (and yes, I rewrote that line a few times and it still sounds cheesy). Time will tell, but he’s still getting dragged to as many National Parks as possible. After we got done with the cave tour we hopped in the car and started for Tennessee. Thanks to construction just over the border, we didn’t get in until late. But when we did get in we met up with Heather’s Aunt Sandy for dinner at Calhoun’s over in Pigeon Forge. Good burgers, great beer, and wonderful company makes for a nice end to a day of driving. From there we headed up to Douglas Lake and got settled in to our home away from home for the next week. Nope, not cheesy at all.